For other uses, see Riverbend (disambiguation). Riverbend was established as a neighbourhood in 1982. It is represented in the Calgary City Council by the Ward 9 councillor. 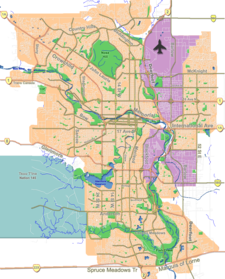 In the City of Calgary's 2013 municipal census, Riverbend had a population of 9,682 living in 3,450 dwellings, nearly identical to its 2012 population of 9,684. With a land area of 4.1 km2 (1.6 sq mi), it had a population density of 2,361.462,361/km2 (6,116.26,120/sq mi) in 2013. Residents in this community had a median household income of $78,574 in 2000, and there were 6.1% low income residents living in the neighbourhood. As of 2000, 17.3% of the residents were immigrants. A proportion of 2.5% of the buildings were condominiums or apartments, and 3.5% of the housing was used for renting. ^ a b City of Calgary (2006). "Riverbend Community Statistics" (PDF). Archived from the original (PDF) on 2008-04-11. Retrieved 2007-05-16. ^ "2013 Civic Census Results" (PDF). City of Calgary. 2013. Retrieved August 20, 2013. ^ "2012 Civic Census Results" (PDF). City of Calgary. 2012. Retrieved February 4, 2013. ^ City of Calgary (2004). "Ward 9 Profile" (PDF). Archived from the original (PDF) on 2010-07-23. "Ward 12 Profile" (PDF). Archived from the original (PDF) on 2007-08-09. Retrieved 2007-05-16. This page was last edited on 19 June 2018, at 21:39 (UTC).